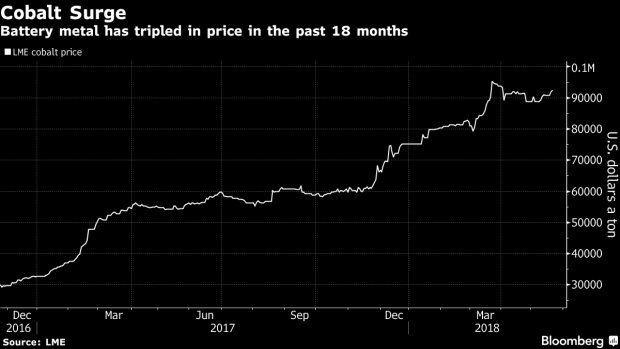 (Bloomberg) -- A streaming deal for cobalt and nickel from a mine in Papua New Guinea may foreshadow other similar arrangements as producers look to capitalize on the battery-commodity boom to raise cash for investments. On Tuesday, Cobalt 27 Capital Corp. -- a Toronto-listed vehicle designed to invest in the metal -- said it reached a $113 million deal with Highlands Pacific Ltd. to buy future production from the Ramu mine in PNG. The Australian-listed miner’s shares surged as much as 56 percent Wednesday in Sydney. Cobalt is a key ingredient in lithium-ion batteries. But it’s often found as a minor byproduct of copper and nickel mining, and only a few places produce meaningful quantities. More than half of global supply comes from the Democratic Republic of Congo, an impoverished country beset by corruption scandals and political unrest. That’s bringing streaming arrangements into focus at non-Congo mines. Vale SA is tendering its cobalt output from its Voisey’s Bay mine, and Sherritt International Corp. has said it’s been fielding offers from investors looking for a share of its production in Cuba and Madagascar. Canadian gold producer Agnico Eagle Mines Ltd. is dusting off idled silver-and-cobalt mines for a potential sale, after receiving inquiries. For Vale, a cobalt stream at the eastern Canadian mine may be the only sensible way to fund a switch to underground operations, although the company is exploring other options as well, Chief Executive Officer Fabio Schvartsman said in an interview from Bloomberg’s New York headquarters last week. In a streaming deal, an investor provides upfront funding to miners in exchange for a share of their future output. Historically, they have tended to be for precious metals like gold and silver, but the boom in cobalt prices has added a new commodity to the mix. --With assistance from Danielle Bochove.